Owing to the rising disposable incomes and changing lifestyles, there has been a continued rise of facial injectables demand across North America. The market for facial injectables is estimated to be growing a faster pace due to emerging physical appearance obsession globally. The focus on aesthetics and the desire to become young is also anticipated to increase the demand for facial surgeries in the years to come. Not only that, the rise in longevity of these injectables effects has also gained momentum in North America market. The North America market for injectables is anticipated to rise to US$5.8 bn by 2024 from that of US$2.1 bn of 2015. The market is expected to rise at a promising 12.0% CAGR during the forecast years of 2016 and 2024. Based on product segmentation of facial injectables in the market it can be categorized into Collagen, botulinum toxin, particle and polymer fillers, and hyaluronic acid. With a major share accounting in the market as per 2015, botulinum toxin has been leading. The sub segments of collagen being human based and porcine or bovine-based and the sub segments of particle and polymer fillers being calcium hydroxyapatite, Poly-L-Lactic acid and Polymethylmethacrylate Beads or PMMA microspheres). However, botox has been attributing to effectiveness mainly in reducing wrinkles and face lines and skin rejuvenation, making an extensive demand in the market. The segment is estimated to rise with a CAGR of 12.7% within the forecast period of 2016 to 2024. Treatment wise, the regional market for facial injectables is segmented into lip augmentation, facial pain, and wrinkle treatment. Owing to these less recovery time and minimally invasive strategies, the facial injectables are being widely used in the cosmetics industry. Based on end user segmentation, the North America market for facial injectables market is segmented into physician clinics, dermatology clinics, cosmetic centers, hospitals and ambulatory surgical centers. The expanding awareness of beauty and aesthetics in skin rejuvenation is anticipated to fuel the injectable filler demand in the market. The market for facial injectables in North America is segmented into Canada, and U.S. in terms of geography. A large portion of the share of facial injectables in North America came from the U.S. according to the 2015 reports. Owing to the rise in demand for dermal fillers in anti-aging treatment, the market for facial injectables in North America is experiencing a rapid growth. According to The American Society for Aesthetic Plastic Surgery prediction, the popularity of people with skin problems will continue to rise and treatment for which will encourage the uptake of both surgical and non- surgical aesthetic procedures across the region followed by Canada and the Rest of North America. 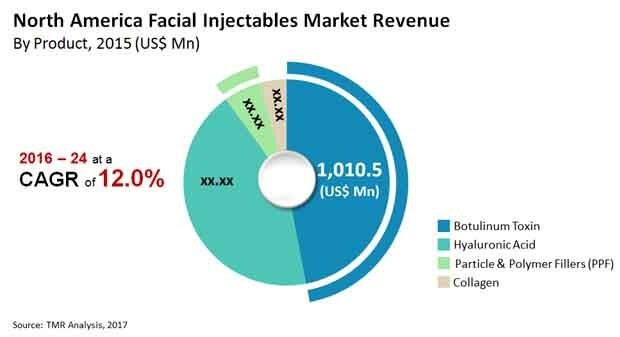 The key players in the market for facial injectables in North America are Bloomage BioTechnology Corporation Limited, Ipsen Group, Allergan Plc, Prollenium Medical Technologies Inc., Galderma S.A. (Nestle), and Merz Pharma & Co. KGaA. Among these, Allergan Plc holds a dominant share in the market making the market fairly monopolistic in nature.